This was a fabulous find for us - a large collection of original, pristine, perfectly preserved 1960s posters by the artist formerly known as Lucia Pearce (now Lucia Capacchione). There are only a few hundred of these in the world and we think all these posters are absolutely stunning. 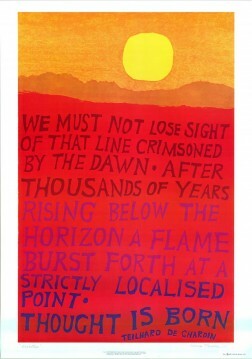 'We must not lose sight of that line crimsoned by the dawn. After thousands of years rising below the horizon a flame burst forth at a strictly localised point. Thought is born.' That was written by Teilhard de Chardin, a French philosopher. Profound! Lucia Pearce was a crucial figure in the birth of the 'New Age' movement in California and is now a world-renowned art therapist and writer. She trained as a Montessori teacher and these posters were designed by her to uplift and inspire both adults and children, drawing on the words of writers such as Kahlil Gibran and Rilke. They are really eye-catching and the colours are so vibrant, with beautifully simple designs and wonderful words. The posters are available signed or unsigned so that you can really acquire a piece of true vintage art history.